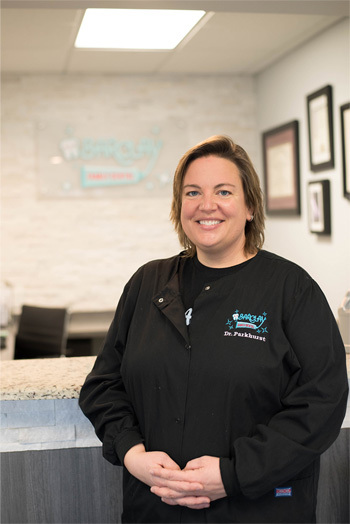 Dr. Delina Parkhurst's passion for dentistry began in high school over 20 years ago when she trained to be a dental assistant. This experience drove her to an education and career in Dental Hygiene, which she practiced for ten years while working on an ultimate goal of becoming a dentist. Dr. Parkhurst has a passion for the art and science of dentistry, with an ultimate goal of building professional long lasting relationships with patients based on trust and honesty. Her goal is to provide you with the best care possible.During Dr. Parkhurst's training at New Jersey Dental School in Newark and Residency training at Staten Island University Hospital in NY; she was awarded with many prestigious awards for excellence in dentistry. Dr. Parkhurst believes education is an ongoing commitment and regularly attends continuing education courses and investigates advances in technology and material. Dr. Parkhurst has been selected as Ã¢"Top Dentists"Â In South Jersey magazine for 2014, 2015 and 2016. When not practicing her passion Dr. Parkhurst lives in New Jersey with her spouse and daughter and their dog Ginger. Her hobbies include spending time with her family, sightseeing, hiking and various art and craft projects.